I came to Flagstaff in search of mountains, forests, canyons and deserts, but not expecting much in the way of good coffee. However, the one place that pretty much everyone recommended was Firecreek Coffee Company, right in the centre of town on the Historic Route 66, almost directly across from the train station (which now doubles as the tourist centre). I’ve already written about Firecreek’s roastery, 111 Roasting Works, which is a few blocks to the south. When I visited, it operated as a tasting room on weekday mornings. Sadly I’ve just learnt that 111 Roasting Works has finished its coffee service, but the good news is that Firecreek, which opened in 2015, is still going strong, serving excellent espresso and filter coffee, plus a range of tea, from the Donahue Building, one of Flagstaff’s oldest, dating from 1888. There’s an excellent breakfast menu, which is supplemented by a wide range of very tasty-looking (and indeed tasty) cakes. These are all served in the large, spacious front portion of Firecreek, while there’s a second area to the rear, which serves as theatre, function room, bar and overspill seating area. You can also sit out front at one of two tables. Firecreek Coffee Company occupies a simple space with a wide front which goes a long, long way back, making it feel like the ceiling is quite low when in reality it’s not. Two tall, square windows flank the central, recessed door, each with a three-person window-bar. Firecreek faces south, so in the winter, it gets the sun streaming in, but if you can stand that, it’s a great spot to sit and watch the frequent freight trains go thundering by. The interior is uncluttered, with seating at the front and the counter at the back on the right, with more seating on the left. Four two/three-person tables on the right, arranged in a square, occupy the space between window and counter, which runs at a 30⁰ angle, from a very narrow front, where the cakes are, encroaching ever further into the space as it goes back. The till is towards the front, while at the back is the three-group La Marzocco GB5 espresso machine. Retail bags of coffee sit on inset shelves at points along the counter, which is made from reclaimed wood found in the basement. Pour-over and bulk-brew are behind the counter on the right-hand wall. On the left, a six-person communal table is followed by a long bench along the left-hand wall with four narrow tables, two long and two short. Finally, another six-person communal table occupies the corner at the back. At this point, the space narrows on the left, while the counter on the right gives way to a second counter, followed by a bar, effectively forming a short corridor which leads to the events space at the back. The bar serves beer and wine, while the second counter doubles as a kitchen for the breakfast service. You can sit at the bar on one of five bar stools, or, if nothing’s on, in the events space, which has a stage at the back, with three tables down right-hand side, a lovely sofa and armchairs on the left, followed by two more tables, and a solitary two-person table in front of the stage. When I first visited, there was a story-telling session going on, and on my last visit, Firecreek was hosting a music festival. When it comes to coffee, it’s all roasted at 111 Roasting Works. There’s an espresso blend (Boxcar) and a single-origin available through either French Press or Bonavita Dripper, or, if you’re in a hurry, bulk-brew. On my first visit, I had the espresso set, a split-shot espresso and 6oz cappuccino (you can also have a 12oz latte from the very cut-down espresso menu). Served with a glass of sparkling water, the espresso was quite old school in taste, a little dark, but not unpleasant. It went well in milk, my cappuccino being very rich, sweet and creamy, with an underlying biscuit taste, although I’d have preferred a double shot to give more coffee taste and less milk. I paired this with a blueberry muffin, served warm, with a good cake base and plenty of blueberries. On my return on Friday, five days later, I had breakfast. There was a selection of Biff’s bagels and a small but excellent breakfast menu, while for lunch there were some savoury muffins and quiche. I had the oat-flour waffle, which was delicious and really light, while not being too sweet/sugary. I had the single-origin, a Kenyan AA, through the Bonavita Dripper, which was an excellent coffee, fruity and delicate. Finally, I popped in the next day, also for breakfast, having the oatmeal, which was served in a cappuccino cup, topped with blueberries and bananas. You can also see what I made of Firecreek’s second branch, Firecreek Big Park, in the Village of Oak Creek, Sedona. 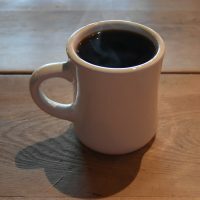 This entry was posted in Breakfast, Cafe/Roaster, Cafes, Cake, Coffee & Beer, Coffee & Wine, Evening Opening, Flagstaff, Laptop Friendly, Lunch, Retailers, Stations Nearby and tagged Firecreek, include, USA2018-01 by Brian Williams. Bookmark the permalink.